Just around the corner from the properties of Condo Hotels Playa del Carmen, is a little ice creamery with a lot of character. Tepoznieves is not your normal ice creamery, however. It is a very special place where you can discover the unique flavors of Mexico, and where one scoop of the delicious refreshing treat is never enough. Tepoznieves is situated on the corner of Constituyentes and Avenida 10, just around the corner from Porto Playa condos. I’m not sure if this is a good thing or a bad thing, but at just 25 Pesos (around $2) for a small cup with two scoops, I’ve decided it’s a very, very good thing. The best thing, however, is that you will be offered samples of various flavors before you decide on your favorite. And I’m talking about very unique flavors here! Tequila ice-cream (yes! ), queso (cheese), avocado, mantequilla (butter) and more. Of course the usual suspects are still available such as chocolate, but it’s not just any chocolate, this is Mayan chocolate made from pure cacao with dark chocolate chunks and it is absolutely delicious. 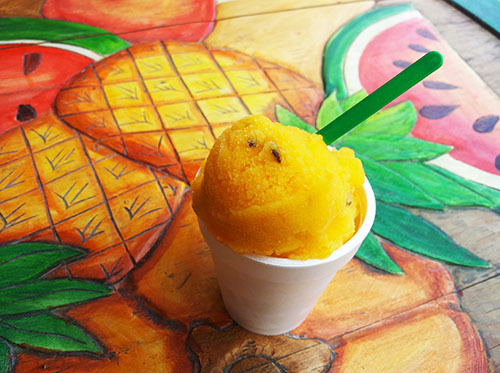 There are fruit sorbet styles such as passionfruit, limon and mango as well as creamy varieties such as coconut and vanilla. Both cups and cones are available and you can mix your favorite flavors to create a unique taste sensation. They have some of the most original ice cream flavors I have ever had, such as deliciously fruity guabana or the blow-your-head-off ‘coffee with yoghurt’. Initially some of the flavors seem a little strange, but I love the way they take off-beat ingredients such as basil, rice and corn and turn it into a delicious sweet treat. The really adventurous can even sprinkle on a little chili powder for a truly local taste! The small store is beautifully designed in bright colors and ornate decorations, creating a vibrant atmosphere for the eyes as well as the taste buds. Small tables decorated in brightly colored fruit and vegetables adorn the sidewalk where you can sit and watch the world go by as you savor your refreshingly treat. What’s more, Tepoznieves uses all natural ingredients which means no nasty chemicals or additives. Children are safe to enjoy a special treat on a hot day without parents worrying about preservatives or artificial flavors. The all natural ice cream also makes a lovely desert after a dinner on Fifth avenue, as it is such a lovely spot to sit in the evening and catch a cool sea breeze. I think everyone who visits Playa del Carmen should visit Tepoznieves, to experience the unique flavors of this wonderful country. Never before has ‘going for ice cream’ been such a culinary and cultural experience, and its convenience to Condo Hotels’ properties means there is simply no excuse not to stop by for a scoop… or three. Believe me, once you try it, you’ll be back for more!